The passing of a friend … Glenn Bennett, Jr. Many of our readers knew Glenn Bennett, Jr. who grew up in the area. 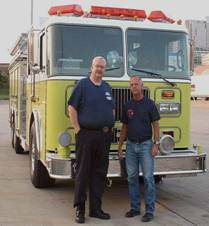 Others may have known him from his years driving and delivering trucks for Seagrave. In April of 2016, we posted an article about an accident that Glenn was involved in. He was hospitalized out east and then transferred to a rehab center in Wisconsin where he lived. Glenn passed away this past Sunday, November 4th and will be missed by all those whose lives he touched. Glenn Bennett Jr. of Three Lakes WI passed on November 4, 2018 at home surrounded by family at the age of 67. He was born August 25, 1951 in Evanston, Il. Glenn was a fireman for a total of 37 years between Northfield IL and the Three Lakes Fire Department. He became an employee of FDW Seagrave and delivered fire trucks all over the United States and volunteered his time during 9/11 to help with the recovery efforts and gave his support. He enjoyed his time outdoors working in the yard, going fishing with family, spending time in Florida, and a good laugh. He was proceeded in death by his parents Glenn Bennett Sr. and his mother Elizabeth Bennett. Survived by his wife Anita and daughters Lauren Madl (Paul Madl), Barbara Bennett, Ashley Edwards (Bryan Edwards), 2 grandchildren, 3 brothers and 2 sister’s. Anita would like to thank everyone for their support and prayers during this difficult time. A visitation will be held at Gaffney-Busha Funeral Home in Eagle River WI, on November 10th 2018 from 10am-12 noon. Thoughts from John Tobin, a longtime friend of Glenn, posted previously on Facebook.